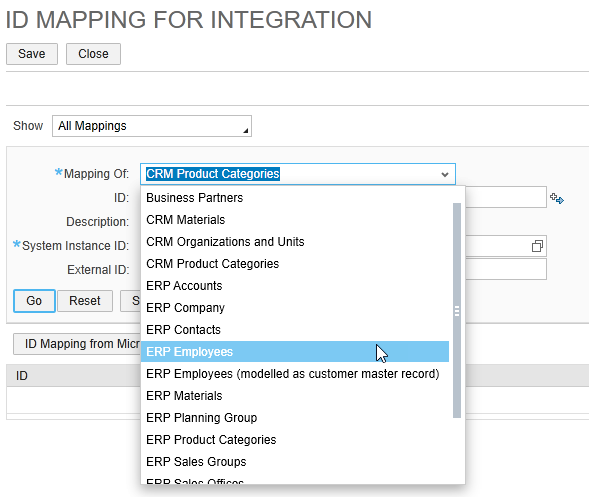 In this blog I will show how to do the ID Mapping for Integration for Employees, that is required in C4C implementations where Integration with ERP is in scope. The basic idea is that C4C keeps an internal ascending ID list, which in our case starts with an “8” where in ERP side, every employee is considered as a Vendor, with Account Group Z007 so it starts with a “7“. What we want, is to map these values so these system can communicate in the same language, understanding the same things, about the same person. 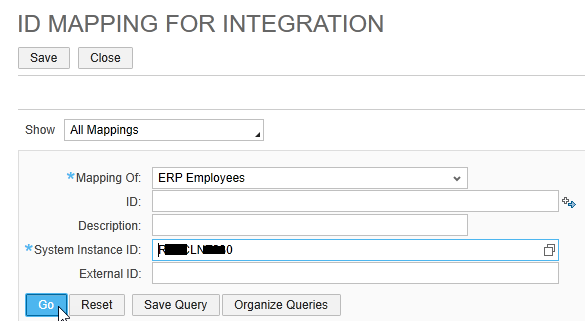 To do that, navigate to “APPLICATION & USER MANAGEMENT“, click on “ID MAPPING FOR INTEGRATION“, and then click on “Edit ID Mapping for Integration“. 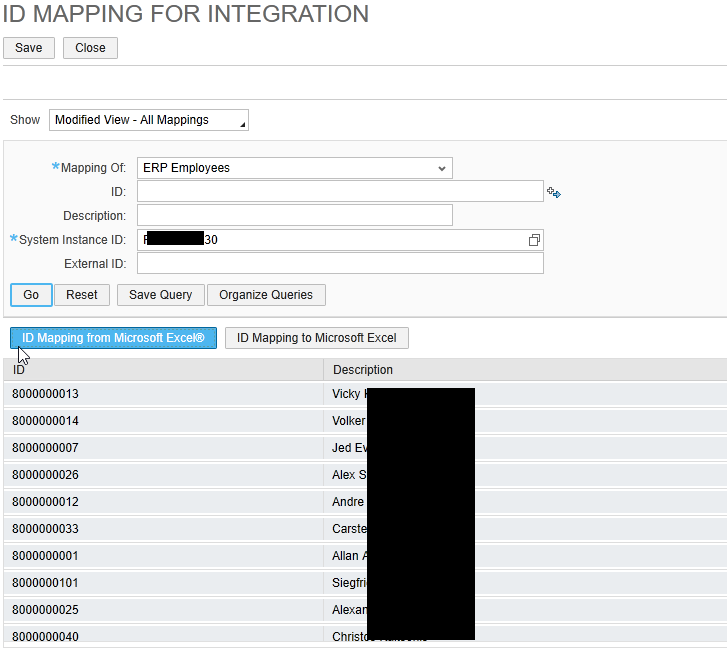 Then click on “ID Mapping from Microsoft Excel” and save the document locally. 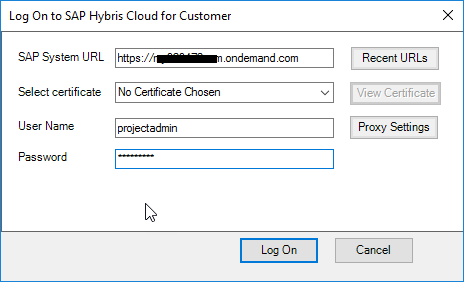 When the Excel file opens, (you must have downloaded that Microsoft Excel Add-in from the Downloads area inside C4C) navigate to the “SAP HYBRIS CLOUD FOR CUSTOMER” tab, and click on “Logon“. Then, click on cell C4 (next to Mapping of), press “Lookup” and in the popup window, click on “Search” with an empty value. Same actions are needed for the “System Instance ID” cell C5. 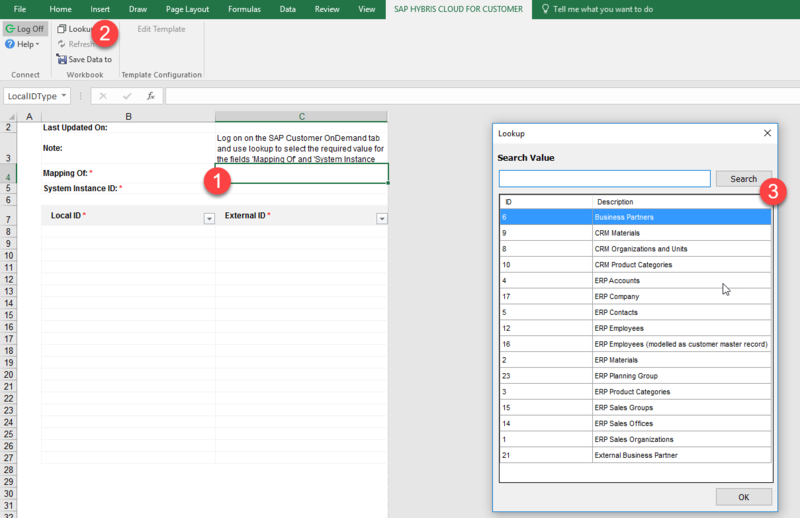 Once done, under the Local ID column, enter the C4C internal ID for the employee you want and in the next cell, the External ID as found inside ERP. Once done, press the “Save Data to” and the popup window will inform you for the success or failure of the process. Thank you for detailed explanation. I have loaded employees data by using standard template now I would like to maintain the ID mapping for those employees but I am getting below error. Thank you for the blog. Is there a way to remove id mappings using the excel add-in. Keeping a blank entry is not helping as the system is expecting a value there. I have the same requirement. Have you found a solution? Unfortunately none so far, will update if I happen to find one. What is solution to remove ID mappings from C4C system? Haven’t tried anything since. However I think you can try to remove the external ID using mass upload (Data Workbench). I hope it works. Nice idea but not possible. Even creating custom ODATA doesn’t expose the External ID. what to do if the “Lookup” feature is not working and there is no value help to chose from for the “Mapping Of” and “System Instance ID”? Is the solution for removing ID mapping available now?